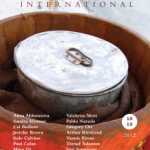 I received my contributor's copy of Poetry International (SDSU Press, 2010) yesterday afternoon. It is an excellent annual anthology of poetry, essays, and reviews from the U.S. and abroad. I am honored to have my short poem, "At the Zoo" appear alongside poems by living poet-heroes of mine such as Yehuda Amichai, Stephen Dunn, and David St. John. I plan to read this poem tomorrow night at the Carnegie Art Museum as part of my set. At the request of reviews editor Sarah Maclay, I also reviewed two books for this double-issue edition. Julia B. Levine's Ditch Tender is voraciously associative in its exploration of the human condition. Robert Gibb's World Over Water burns with the quiet intensity of the past. I am equally excited to discover new authors, books, and ideas about poetry through this 445-page literary tome. Like firewood stacked in the shed, there is fuel here to last all year, and I am grateful to have contributed my own small share of kindling to the mix. Categories: Poetry and Publications. Tags: Poetry International. Poets: Julia B. Levine and Robert Gibb.